A family have clean water at their house for the first time ever. The need for clean, bacteria free water to keep villagers and children healthy in villages and schools in Fiji’s Savuasavu region is significant, particularly as an El Nino drought is forecast . So the Fiji clean water project by the Rotary Club of Savusavu was born, sponsored by a matching Global Grant with the Rotary Club of Point Loma and the Rotary Club of San Diego (also called Club 33), San Diego, CA. It took Savusavu Rotary member and project leader Jeff Mather a year to design and perfect the Safe Water Stations that will allow individual households to filter water drawn from a variety of sources that are often a source of acute and chronic illnesses The units use small Sawyer water filters commonly used for backpacking and these, with the buckets and other hardware are imported from the US. It is then a monumental task to paint, stack, label, drill, nail, assemble and carry the water stations back & forth until fully assembled, thankfully helped by a dedicated group of Rotarians and community members. The project will be initially building 240 stations and deployment includes delivery, installation and assurance of sustainability through “Train the Trainer” days where people from each deployment location are trained in the use and maintenance of the unit and who will then on-train others. When the first batch of 40 units were ready, members of the Fiji Home Water Filter Project and Ministry of Health officers met with the Savusavu Hospital nursing staff in charge of the community health workers at the Vunivesi Village Community Hall to show them how the units worked and explain the project which will be deployed in the areas visited by them. They were very impressed and enthusiastic about the project. Once everyone got their stations dispensing beautiful, clean water, there were many villagers who continually brought in large bottles, bowls and various shaped buckets to fill up with the clean water to take back to their homes! The need is clear. The first village deployment of 36 Safe Water Stations was Vunivesi Village on 31 July with the whole village excitedly gathered at the Community Hall for a welcome ceremony and a briefing, community leadership signing an agreement of commitment, and a training session before the units were installed into individual homes. 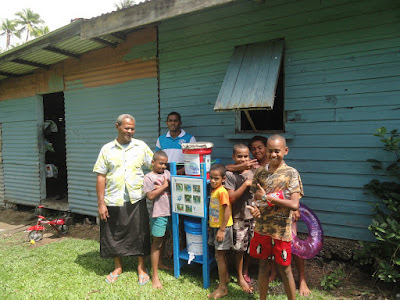 Levuka village received the second deployment of 25 units and Nabalebale village with 65 households was the largest deployment for this project. In usual island style, these deployments were highlighted by ceremonial welcomes including dance, food and the ever-present smiles of gratitude. Special thanks goes to committee members including Barbara L’Ami (current President), Susan Stone (current Sec), Point Loma committee member Debra Gookin & Club 33 member Mike Conner for the outstanding success of this on-going project.